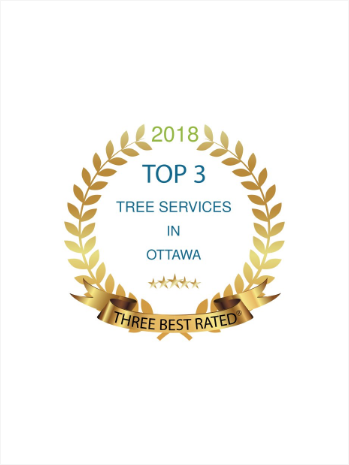 Rock’s Tree Service is celebrating being chosen as one of the top three tree services in Ottawa, Ontario by Three Best Rated®! Three Best Rated® finds the top three local businesses, professionals, restaurants, and health care providers in cities so locals can be made aware of highly recommended services in their area. Quality customer service, acting on promises, and other expectations are not practiced by all companies, so after having been evaluated by Three Best Rated®’s 50-Point inspection, Rock’s Tree Service is honoured to have this title. We know that our customers work very hard in their own right and can’t always be available to meet with our certified arborists. We prioritize our customers, which is why our operating hours are 9am to 9pm from Monday to Friday and 9am to 5pm on the weekend. With this wide range of hours, our customers have ample opportunity to contact us at their leisure, be present when we show up for their appointment, gain quality information, and develop a trust with our arborist experts. Having informative and authentic images are important for our new and current customers so they can understand what we offer and how we intend to deliver on our promises while developing a trust with us. With great business images, our customers discover answers to their questions and have their plant fears allayed. Our images also translate the effort, dedication, and caring that’s at the core of our business. At Rock’s Tree Service, we do our best to make Ottawa beautiful and healthy. Nothing gives us more pride that seeing the yards of homeowners lush and thriving. Because we value our customers and their concerns, we strive to stay on top of current issues in arborist communities and inform on best practices. Rock’s Tree Service experts do solid research and continually look for innovative techniques from which both you and your plants will benefit. We are deeply grateful to our customers for their love of nature and the tender care they show by contacting our certified arborists to effectively handle their tree pruning and removal, hedge trimming, stump grinding, as well as inform them about harmful tree insects, like the Emerald Ash Borer. As one of Ottawa’s first-rate tree services, you can expect us to continue in providing expert arborist consultations and free estimates, along with maintaining our best practices that are beneficial to plant life.